Cindis World: Old El Paso & MyBlogSpark "Family Taco Night" Review and Giveaway! 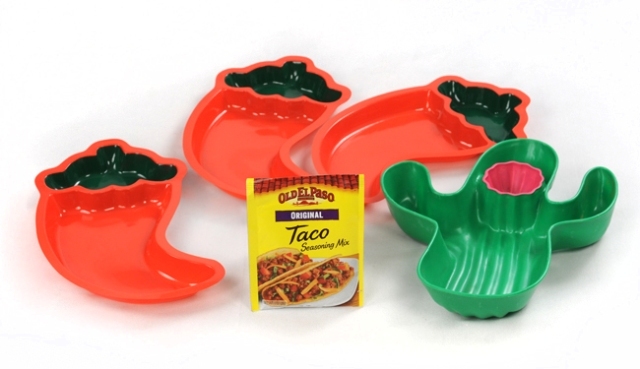 Old El Paso & MyBlogSpark "Family Taco Night" Review and Giveaway! My family have always been huge fans of Old El Paso products. We definitely have at least one night a month where we indulge in a feast that begins and ends with Old El Paso. The wide variety of products makes trying new recipes so fun, from the chilies, dinner kits, dips and sides, to the enchilada sauce, refried beans, seasoning mixes, shells, taco sauce and salsa. And the many choices of flavors for the taco seasoning mix like Burrito, Cheesy Taco, Chili, Fajita, Taco, Mild Taco and even a seasoning with 40% less sodium. You just have a never ending flavor assortment! You can visit Old El Paso for news and great tips, recipes and more. Take a minute to share family fiesta photos and videos from Family Taco Nights on the El Tacodor Family Spotlight! 1/2 to give to my daughter and her husband for later, tortilla chips, salsa, and a seven layer dip. Old El Paso through MyBlogSpark has also offered to provide the same items to one of my lucky readers! You will receive everything pictured, PLUS a $10 gift card to purchase the groceries needed for your own Family Taco Night! If you would like to enter, just leave a comment telling us what your favorite recipe is using Old El Paso products. Be sure to leave your email address in your comment so I can contact you if you win! If you would like additional entries, you may add seperate comments for each additional thing you do, but you MUST do the required entry for any of the additional ones to count. - Follow my blog via google friend connect, located at the upper left side of the page. - Tweet about this giveaway - this can be done once daily, for an extra entry each day - "Old El Paso & #myblogspark prize pack & $10 g.c #giveaway http://nblo.gs/exJVI "
Please be sure to leave a seperate comment for each entry, and your email so I can contact you if you win. This giveaway will end Friday, February 25th at 12 pm EST. Winner will be chosen via random.org, and I will contact the winner through email, and they have 48 hours to respond or another winner will be chosen. Old El Paso and MyBlogSpark provided me with all information, and the products and gift card, and are providing the winner with the same prize pack. I like the dessert tacos recipe on their site. The fajita recipe is the next one I'm trying. I love using the packet seasonins to make no meata fajitas, and fajita fondue! Will post recipes up of both those food items shortly! Published your button on my blog!! Yay!! I always use Old El Paso Taco Seasoning when I make Taco Dip! I like using refried beans for salad and beef stew. I use the Taco Seasoning when I make Layered Bean Dip. I put some into the sour cream and mix it! Thanks! following you on gfc! email in my profile. I like the recipe for double layer tacos. i love to make taco dip! its a huge hit with everyone. Mmmm I love their refried beans! I put them in all of my burritos, which I freeze up for days I don't feel like cooking! We love the hard taco kits. The dessert taco recipe sounds great! We love crunchy shell tacos. My favorite recipe is to use their taco sauce and make tacos! I make a great taco casserole using old el paso taco seasoning and taco sauce. when i make my chicken fajatias i use their taco seasoning mix for some added flavor! mine isnt listed. el paso is the only way to go for turkey leftovers at thanksgiving and ham at easter throwing together burritos. it is incredible in the microwave even and ive never found another one that i like as well followed you on gfc.